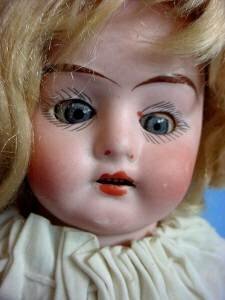 Antique Doll Sales April 2010 # one with pictures, values, descriptions and much more…. 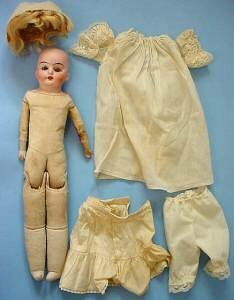 Here is the first history installment for the month of April, for many doll and doll related online auction sales. Hopefully, many questions about values can be answered here and in the up-coming additions to this website. For those of you planning online auction sales, this may serve as a guide as well. We are also interested in your online selling experience, whether it be VIA online auctions, or just a straight selling web site, perhaps your own a website. There is a form below which you can use to tell us about your online selling experience. 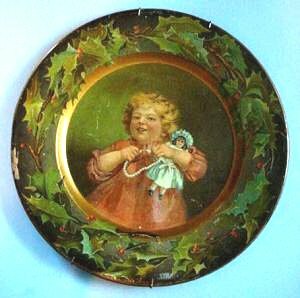 If it was sold on your very own website - include your website URL and we will provide a link from our site to yours - please, it needs to be an antique and collectible doll site. Head has some minor overall paint loss......see photos. Does not appear to have any repaint or touch up. Her body is old cloth...very firmly stuffed......heavy material with mitten shape hands. Heavy body. 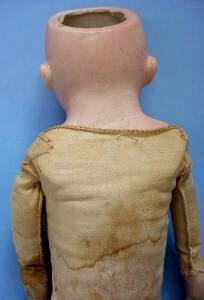 Overall age stained.......old socks have been sewn to body. Her clothes are just a new cover up. 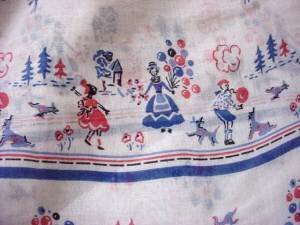 Overall good condition.......normal age discolor and wear. Click here to see active listings on eBay for Vintage Minerva dolls, you will need to register with eBay in order to to see completed items. Dresses for large doll such as Playpal.....and big composition baby. 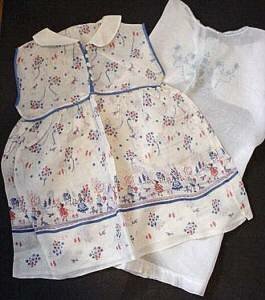 Vintage child's dress has whimsy print and piping trim. 5 button front closure.....half of one button missing. Needs about 3 stitches to secure bottom hem seam. 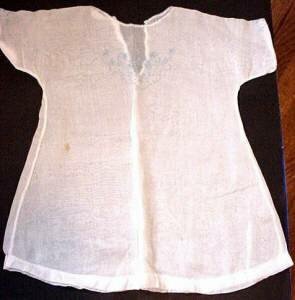 Blue embroidery on thin white dress. Approx. 21" long....12" across shoulders. Has some stains. Pin back closure. This is the type that is easily cut down to fit antique chinas and paper mache. Just seam the T shape ....cut away excess. Click here to see active listings on eBay for Vintage doll clothing, you will need to register with eBay in order to see completed items. Sweet little girl. Approximately 15" tall. All I can see of markings is "Special". I can not see any chips or cracks......do not have a "black light" to check for hairlines. Although body covers the shoulder head......I think I can feel a small chip on front edge of shoulder plate. She has sleep eyes......light rub one cheek. Her body is jointed cloth......good age stained condition. One bisque arm has glue residue where it has been glued back to upper arm cloth.....and the glue is all over one hand/fore arm. Bisque arms are good....no chips. Her mohair wig is loose....seems a tad big.....but maybe when secured it will fit better. Am not going to secure......as eyes have tissue to protect in shipping. She wears a home made antique gown.......her slip and pantaloons are more recent. Click here to see active listings on eBay for Antique Bisque German dolls, you will need to register with eBay in order to to see completed items. 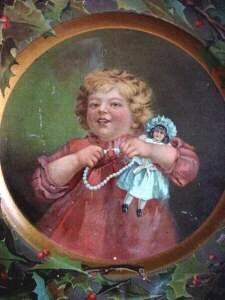 Unusual because the child is holding a doll. Approximately 10" diameter. Plate is tin.....or metal. Probably early 1900's. "Compliments of C.D. 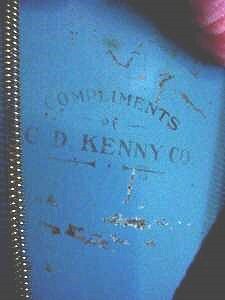 Kenny Co." on the back. There are some scratches and paint loss overall....fortunately not all that distracting......and only the one arm has thin scratch. See photo. On rim where there is paint loss there is also some mild surface denting.......in the paint loss area. See photo. Displays very well......but not perfect. Good color.